This stately Norman style house, designed by Willing, Sims and Talbutt for Dorothy Falcon Platt, and built in 1923, is truly exceptional. 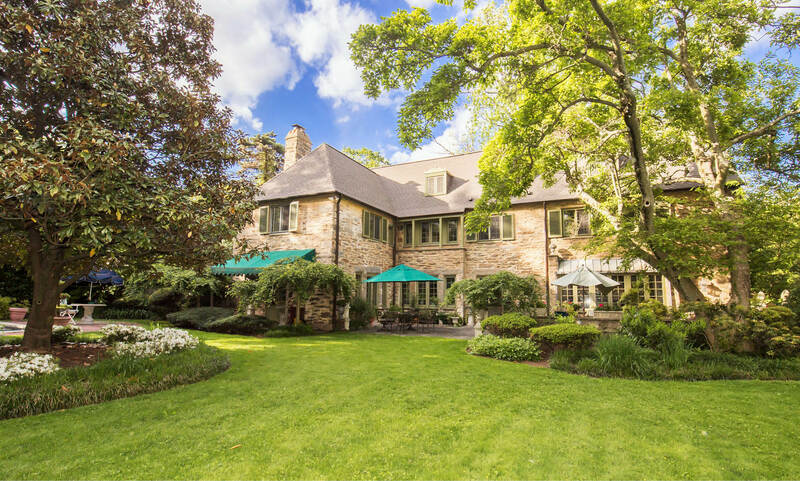 Mrs. Platt, a noted horticulturalist and artist, created an unparalleled garden oasis, and the original landscape design has been thoughtfully maintained. The home's design features this garden as an extension of the house, with French doors to the terrace from both the living and dining rooms, and broad windows in the gallery connecting the two rooms. The tall garden wall adds both architectural interest and privacy. A beautiful lap pool for exercise or entertainment has been added to the garden. The lovely first floor interior has living and dining rooms, each with fireplace, butler's pantry and kitchen with adjacent den or breakfast room. The home features three bedrooms and two baths on the second floor, including master suite with fireplace, bath, and dressing room.The third story includes bedroom, bath, study, and extensive storage area. Multiple architectural elements grace the house - balconies, terraces, large fireplaces, handsome millwork and moldings, exposed beams, wide plank floors, large windows, and high ceilings. Incredibly, this private home is just steps away from the shopping and dining of Chestnut Hill, and less than thirty minutes to Center City by car or train. Just steps to all that Chestnut Hill has to offer!